What is a hexagon ? Definition and examples. A hexagon is a polygon with six sides. Here are some examples of hexagons. Notice how the sides of the figures above have different lengths. 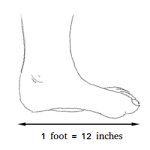 Notice also how the angles inside the figures have different measurements. That is the reason the two figures above are called irregular hexagons. 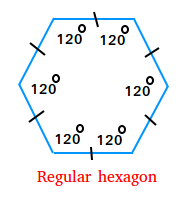 As long as the figure has six sides and the figure is not open, it is a hexagon. A regular hexagon though is a polygon with six equal sides and six equal angles. The black mark that you see on each means that all the sides are the same. Moreover, each of the six angles is equal to 120 degrees.